https://sep.yimg.com/ay/yhst-33477391359232/dot-dash-butterfly-fish-chaetodon-pelewensis-punctatofasciatus-spotbanded-spot-banded-butterflyfish-6.jpgDot Dash Butterfly Fish - Chaetodon pelewensis - Punctatofasciatus Spotbanded - Spot-Banded Butterflyfish EasyPeaceful55 Gallon5.0 inchesNoOmnivore, BrineIndo-PacificChaetodontidaeSmall 1" - 2"
The Dot Dash Butterflyfish, also known as the Spotbanded Butterflyfish, Punctato Butterflyfish, or Spot-band Butterflyfish, has a yellow-tan body. As it matures, it becomes more yellow dorsally with about seven vertical dark stripes on the upper half of the body, with rows of dark spots below. The aquarium for the Dot Dash Butterflyfish should be 50 gallons or larger, have numerous hiding places, and calm tank mates. It should not be housed in a reef aquarium since it tends to eat most invertebrates. Behaviors: In the wild this species is found in very large schools, thus, it is able to be kept in groups in the aquarium environment as well. The juveniles of this species will actually act as cleaner fish to other larger species. This species tends to be peaceful with every other aquarium fish species, only rarely showing any type of aggression. 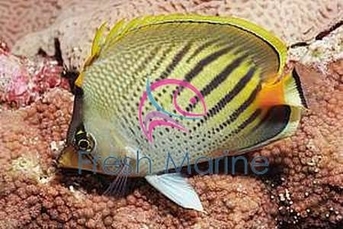 Maximum Size: Dot Dash Butterfly or the Chaetodon pelewensis grows up to 5 inches. Minimum Tank Size: The Dot Dash Butterfly prefers a tank of at least 60 gallons with plenty of places to hide & swim. Breeding: The Cot Dash Butterfly Fish is an egg-scatterer.